Ensure your backyard birds roost in peak style by placing this Heartwood Mahogany Arrowhead Lodge Bird House in your garden. This truly dramatic shelter adds wonderful architecture and interest to your bird garden, thanks to its mahogany body, copper roof, and brown hues. The extended, rectangular body provides birds plenty of room to nest, while the pointed top of the piece enhances the arrowhead theme. A dark brown, arrow shaped panel sits on the front of this home, contrasting the lighter brown body and bringing unique style to the unit. The copper roof fully covers the home, and adds elegance to the setting with ease. The 1.25" diameter entry hole allows small birds to easily access the piece, and the tall shape helps the unit remain well ventilated. Drainage on the base keeps the nest dry, and a disc on the back of the home may be removed for seasonal cleaning. Place this piece against a wall or fence using its attached hanging hardware, or rest it on a level surface indoors for a beautiful home accent. The varying brown tones complement your garden or home perfectly, and the mahogany and copper construction brings a sophisticated hint to any setting. 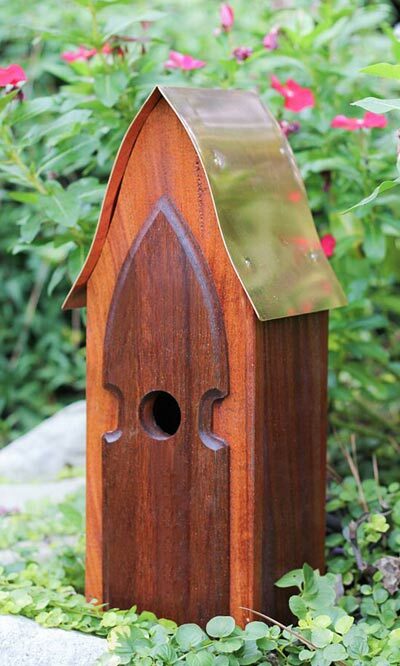 Invite songbirds to nest in remarkable style in this Mahogany Arrowhead Lodge Bird House. Made in the USA.